If any post warrants an all caps title, its this one. BOSTON MARATHON!!! Well. Twelve years after I first got bit by the marathon bug, I got to run Boston. 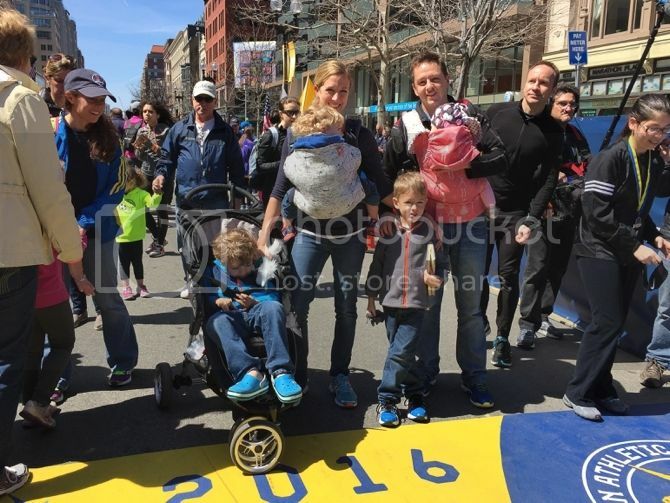 It was my tenth marathon, the 120th Boston and 50th year women were allowed to participate. The math teacher in me loved all that. Merritt is seven months old--not the best sleeper and still exclusively nursing. So I had to bring a pump and pump at the starting line. It was comical--I stuck a trash bag with a hole in it over my head and walked the .7 miles to the start pumping in secret. Heh heh. And then I abandoned the liquid gold with everyone's sweatpants. Here's the race recap before I forget everything that happened... I rode the bus in to Hopkinton (our bus got off at the wrong exit and had to make a u-turn, not a great start to the day!) The races is basically 26.2 straight miles into Boston. Straight--but hilly. I had been warned about the hills, but Beaumont is so flat, and I decided that I'd just take it easy and then the hills wouldn't bother me. That didn't end up working very well... but I survived. It was an unseasonably warm day--so my Texas training helped me there! I forced myself to hold to close to 8:20s for the first 4 miles, then tried to stick to 8:15s for the first half. I was feeling great and it was tough to take it slow. I'm so glad I did, because at about mile 16 my legs decided we were done and it was tougher to stay on pace. At that point, I kept thinking WHY DID I WANT TO DO THIS RACE SO BADLY?? But I kind of had to finish... so on I went. The last four miles were quite a bit slower. 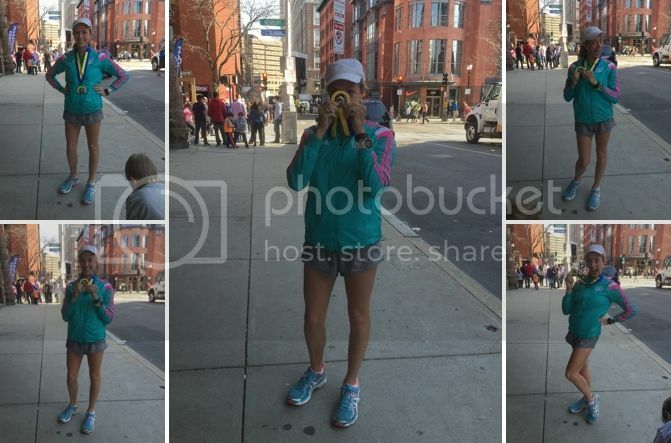 Once I got to Boston, I just wanted to enjoy the experience so I kind of coasted back in. I stopped to use the bathroom (a first!) and stretched once. The crowds and experience was magical--it really felt like the community's race. People were in their front yards handing out wet paper towels, water, oranges, bananas, vaseline... spraying people down with water. It was amazing to watch Boston step up and help the runners. I ended with a 3:46:14--which I was happy with. I ran marathons after having Finley and Braden and was around 4:15, so this was a huge improvement over my post baby times. I fought and fought to get close to 3:40 for so many races, so to be able to fairly easily run a 3:46 felt great. I've learned a lot about how to train for a marathon and take better care of myself over the last 10 years and its paid off. Next step: qualifying for the Olympics. I kid, I kid. But seriously. I felt horrible after the race. Terrible. Maybe worse than I've ever felt before? I think it was a combination of the heat and hills. My cheering section (who I failed to get a picture with! Sol and the kids, Aunt Maya and Uncle Tom and Tom's parents) met me on Newbury Street. I couldn't walk any farther. I had some Shake Shack milkshake and rested... then felt better. 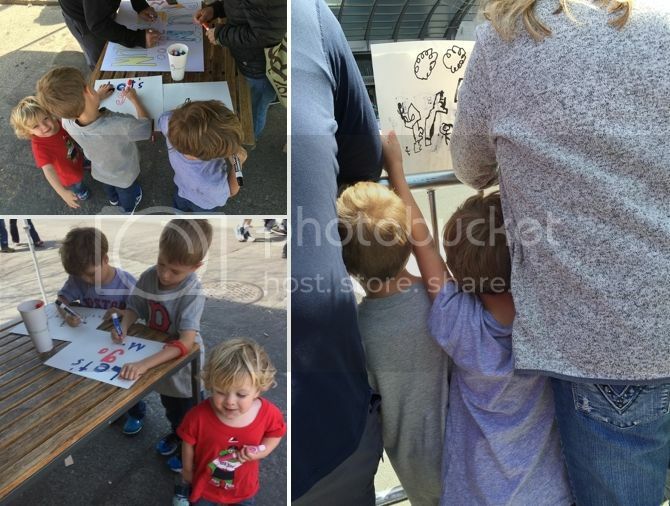 My sweet boys made some signs and were excited to be part of the marathon experience. Finley was hoping I'd come in the top 20. He was not impressed with me. I am now the proud owner of the ubiquitous Boston jacket. This year's jacket looks a bit like something you would have roller skated in 25 years ago, but I'll take it. Everyone wears the jackets all weekend and it's like a really cool club that I got to be in. 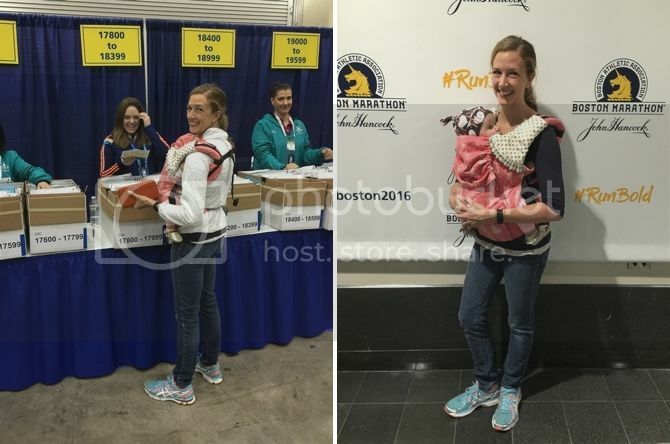 People thought I was pretty fabulous when I walked around in the jacket while carrying Merritt--you ran a marathon after having a baby?? Yes, yes I did. I'm amazing. So I ran it. Much like childbirth, it hurt and I wanted to never do it ever again when I finished... but now the rose-colored amnesia has set in and I'm all about it. I'm running Houston in January, so we'll see if I can beat the stupid cut off time legitimately this time. Thanks SO much to everyone who cheered for me and donated--you guys are amazing. Finley cracked me up. But I'm so proud of you too.